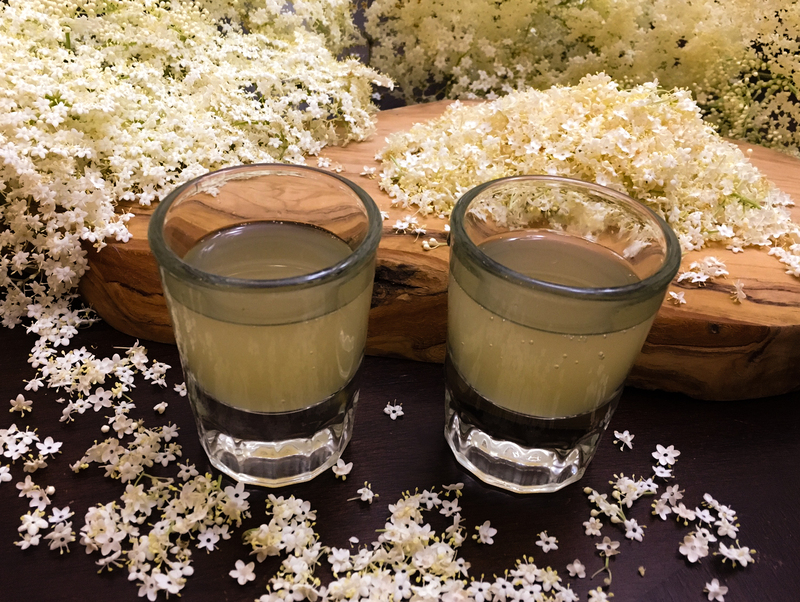 Sparkling elderflower cordial is a simple recipe that lets biology do the “cooking,” while dazzling your taste buds with bubbly deliciousness. Each year in late spring (usually between the last week of May and the first week of June in our area), a brief two week window of time opens, wherein one of the world’s most delightful culinary treats presents itself for harvest: elderflowers. 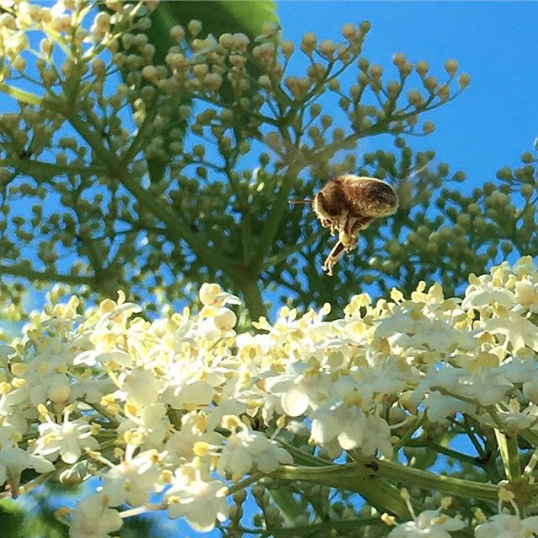 A honeybee making a landing on a cluster of elderflowers at Tyrant Farms. 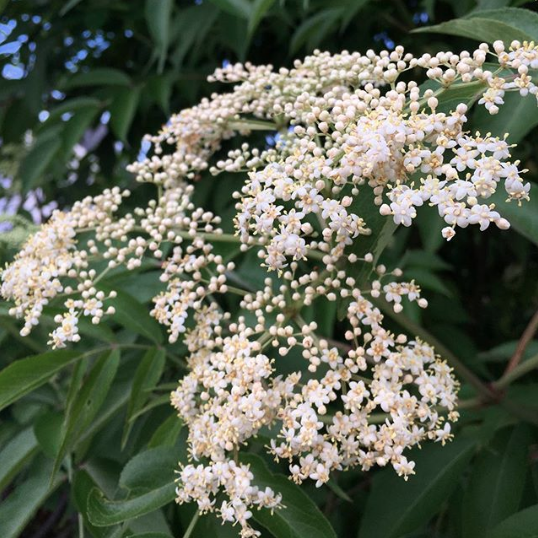 Elderflowers are the clusters of delicate white flowers adorning elderberry plants, a large bush/shrub that thrives in temperate regions around the world. Ripe elderberries are also a prized food and medicinal crop. We use our cultivated elderberries to make elderberry syrup. Interestingly, research has shown that elderberries boost the immune system and make a potent weapon against the cold, flu, and other viral pathogens. 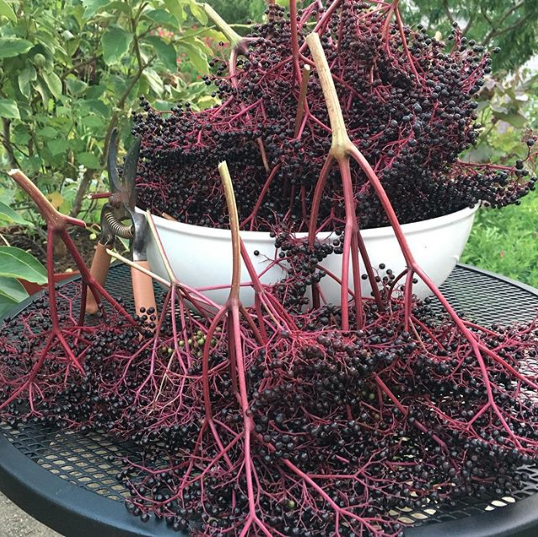 A nightly elderberry harvest during peak season. We have five large, mature elderberry plants growing in our yard, and within a few miles of our house, there are dozens of other wild elderberry plants growing. If the plants are native to where you live and you know how to ID them, you’ll see elderberry plants everywhere. Even without foraging the wild plants growing nearby, our five elderberry plants produce more than enough flowers and berries to last us the year. We harvest whole flower heads when the tiny star-shaped flowers are still bright white, since the flavor is at peak during this stage. Once the flowers have turned tan/brown, they won’t contain the nectar and pollen to produce their famous, delicate flavor. We cut whole flower heads off of the plant in the early morning before our pollinators have had a chance to forage their pollen and nectar. Obviously, this means those branches won’t be able to produce berries, so we only take as many flower heads as we need, and we only remove flowers from branches on the outside, bottom of the plants that would be likely to snap under the full weight of a ripening berry cluster (their branches are quite brittle). We leave the flowers on the strongest, most upright branches for a berry harvest, allowing us to maximize the full benefits of the plant. An elderflower cluster starting to open. You want to let more flowers on the cluster open before harvesting. When harvesting, we’ll place the flower heads in large 5 gallon buckets or a woven harvest basket. We can harvest all the elderflowers we need for the year in about 30 minutes. Once harvested, we immediately bring the flower clusters inside to be removed from the stems by hand. This is by far the most laborious part of the process. Since the stems and leaves of the plant are technically poisonous, you want to strip the tiny flowers off by hand. This is what a pile of elderflowers should like (removed from the stems) before you make them into sparkling elderflower cordial. 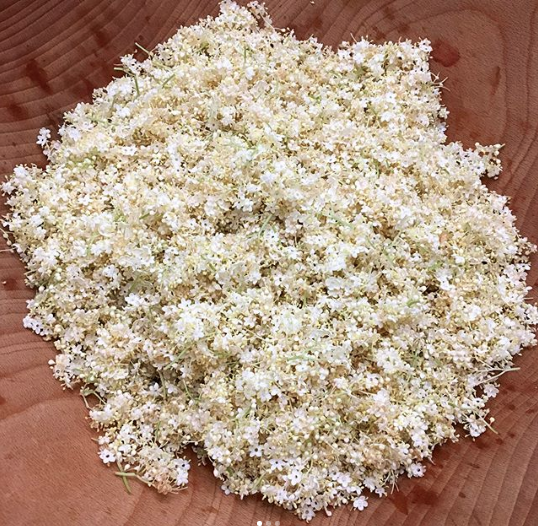 It should take one person an hour or less to strip four cups of elderflowers from their stems. Oh, and since each elderberry plant and flower cluster is its own ecosystem, you will encounter some tiny insects during this process. That’s ok. Put them back outside. Worst case scenario is a few tiny insects become part of your sparkling elderflower cordial, which isn’t a problem. You already eat about 2 pounds of insects every year, so a few more won’t hurt you. If insects really bother you, you can also make this recipe using these dried organic elderflowers that someone else already processed. Sparkling elderflower cordial achieves its delightful bubbles via a natural fermentation process. The beneficial microbes you harness in the process (primarily native yeasts and bacteria on the elder flowers) create the magic for you, similar to the beer and wine-making process. Sparkling elderflower cordial has an incredible flavor that words just won’t do justice to. Sparkling elderflower cordial makes a killer, lightly alcoholic disgestif (probably no more than 2-3% alcohol) to sip after a meal. Of course, before serving, you can also fortify your sparkling elderflower cordial with a non-flavored, colorless spirit like vodka to make it more akin to the famous St-Germain elderflower liqueur made in France. Place elderflowers in a large glass or non-reactive container (not plastic). Add sugar and water to a pot on the stove. Warm the water just enough to dissolve the sugar in the water while whisking - not so warm that it's uncomfortable to touch. Pour the sugar water mixture over the elderflowers, then add in your lemon juice or citric acid. Stir to ensure all ingredients are evenly mixed together. 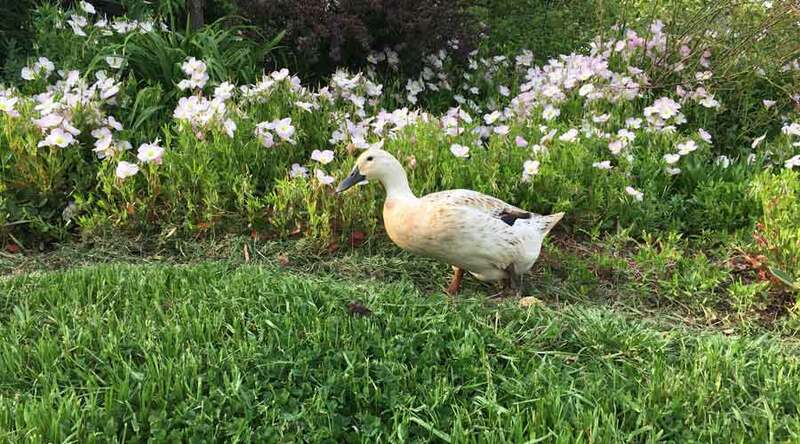 The flowers will soon float back to the surface. Cover the container with a BREATHABLE cloth/linen towel and secure the towel with a string or rubber band. Stir the mixture every 12 hours. Start taste-testing the syrup at the 48 hour mark. Exactly when it's "ready" is subjective and will also change based on indoor temperatures and the activity of resident microbes in the mix. Our sparkling elderberry syrup is usually perfect for us at the end of day 5-7, but your preferences may be different. Once done, pour the mix through a strainer and into another large container to remove all the flowers. Squeeze all the goodies out of the strained flowers by hand, then compost them. Pour the final syrup into jars/bottles and refrigerate immediately to make the microbes go dormant and halt the fermentation process. Refrigerated, sparkling elderberry syrup can last for months. We hope you enjoy this recipe for years to come! If you want to grow your own elderberry plants for flower and berry harvests, you can buy them here.